Freshman midfielder Hank Brown (pictured left) scored his fourth goal of the season in Drexel’s 11-8 loss to Towson in the CAA semifinals. 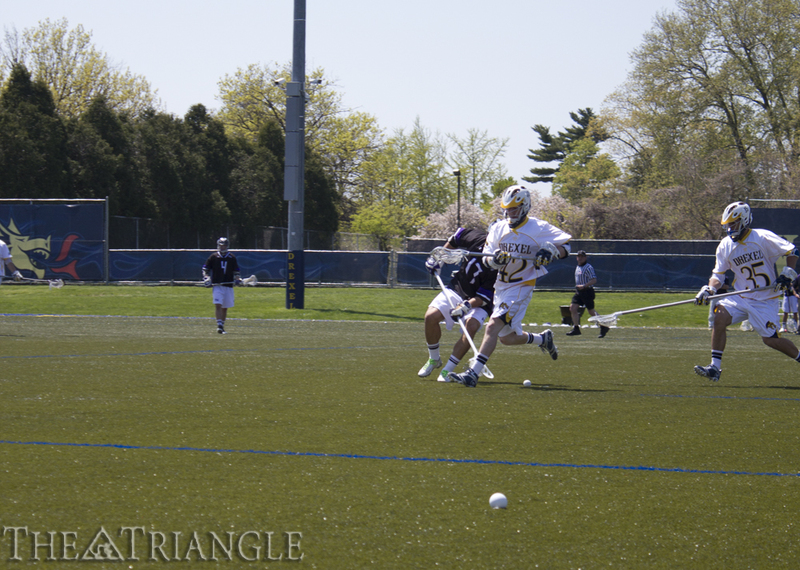 The Drexel men’s lacrosse team’s identity this season was no secret, as the Dragons boasted a run-and-gun style of play that resulted in lots of scoring opportunities. Was it entertaining? Absolutely. Was it consistent? Eh, not so much. At times, Drexel was unstoppable, filling the net at will while opponents looked like deer in the headlights of an 18-wheeler. But at other times, the Dragons were confused and timid, as if they were waiting to get down in order to kick into gear. Comebacks were a huge story for Drexel, as eight of the team’s 11 wins came after they were trailing in the second half. Even though they counted as positives in the record column, head coach Brian Voelker knew the team could not rely on comeback victories to get deep into the postseason. One might even say that the Dragons were playing with fire. For a Drexel team that was so streaky during the regular season, all it would take to get knocked off in the one-and-done format of postseason tournaments would be an extended cold streak. And that is exactly what happened May 1 in the semifinals of the Colonial Athletic Association Tournament, as Towson University defeated the Dragons by a score of 11-8. After a Drexel goal by freshman midfielder Hank Brown with 7:50 to go in the first quarter made the score 3-2 in favor of Towson, the Dragons were held to one goal for the next 26:25 while the Tigers extended their lead to 9-3. Drexel was not without its chances over that span, but Towson senior goalie Andrew Wascavage made four saves in the second quarter to help his team make a huge run. Wascavage made 14 saves on 22 shots on goal for the game for a .636 save percentage, which was just a small improvement over his mark of .611 in the regular season. Senior attack Robert Church finally ended the scoring drought at the 11:25 mark of the third quarter and then added two more goals in the next 2:41 to complete the natural hat trick and bring the Drexel deficit to 9-6. Church also added two assists in the game for a total of five points, which brought his season tally to 33 goals and 24 assists, as he finished with a team-leading 57 total points. Although his storied career as a Dragon came to an end, he made sure the “Church” name will be branded in the school’s record books forever. His 194 career points rank fourth all time in Drexel history, while his 121 career goals are tied for third all time. After some back-and-forth play, junior midfielder Ben McIntosh scored his team-leading 38th goal of the season and second of the game with 3:05 remaining in the third quarter to bring the score to 10-8. But the high-octane Dragons stalled, as they were unable to muster another goal in the final 18:05, and Drexel fell by a final score of 11-8. Towson star attack Thomas DeNapoli was held to one goal and one assist after torching the Dragons for six goals and one assist in the teams’ matchup earlier this season, a 14-11 Drexel win April 20 at Vidas Field. DeNapoli entered the CAA semifinal game with 53 total points, just one behind McIntosh for the conference lead. 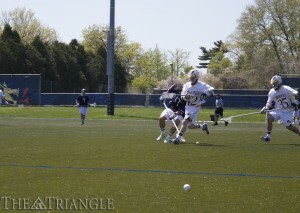 There was a different hero for the Tigers on this day, however, as freshman midfielder Ben McCarty scored six goals on seven shots to lead his team to victory. In fact, McCarty’s six scores matched his entire goal output of the regular season, doubling his overall total to 12. A bright spot for the Dragons was sophomore faceoff specialist Nick Saputo, who dominated his counterpart on the Tigers, winning 19 of 22 draws in the game and adding an assist on Church’s third goal. Also contributing for the Dragons were freshman attack Chris Frederick with a goal and an assist and senior midfielder Aaron Prosser with a goal. As Prosser’s Drexel career comes to an end, his Major League Lacrosse career is set to begin with the Denver Outlaws, the team that picked him in the fifth round of the 2013 player entry draft. Other graduating seniors for the Dragons are midfielders Kris Franklin and Garrett McIntosh and defensemen Justin Hummel and Chris Walsh. They will be some tough cleats to fill, for sure, but Drexel does have a large portion of its core returning for the 2014 season. As for Towson, the Tigers will advance to the championship game May 3 against the top-seeded Pennsylvania State University, the host team of the CAA Tournament. The Nittany Lions won the first semifinal game over the fourth-seeded University of Massachusetts Amherst by a score of 10-7 to advance to the finals. With Lincoln Financial Field as the host site for the Final Four of the 2013 NCAA Tournament, it would have been special for Drexel to make an appearance as the host team, but it was just not meant to be. Instead, Voelker and his guys will have to wait yet another season to try to make history as the first-ever Drexel men’s lacrosse team to appear on the bracket.